The Venice day trip from Milan departs at 7 am from the city centre 2/3 days per week throughout the year. Venice is most pleasant in May and September. We are comparing Venice Day Trip from Milan Prices from leading ticket suppliers and Try to find you Cheap tickets prices on the market. Start your day travelling from Milan city centre, through the sloping hills of Italy's countryside to Venice Piazzale Roma, where you will cross Ponte della Costituzione and launch yourself into the UNESCO World Heritage Centre. Your day will begin with a boat trip on the Venice Lagoon, followed by a 2 hour walking tour. Listen to the commentary of your English speaking guide as you pass Pizzerias and souvenir stores on La Strada Nova. The tour will take you to some of the city's major landmarks such as the church of Santa Maria Formosa, St Mark's Square with its grand basilica and Doge's Palace. In the afternoon you'll have free time to get lost in the maze of narrow streets, take a romantic canal tour by Gondola and eat delicious Gelato before returning by coach to Milan. Don't leave Venice before without sipping a glass of bitter-sweet Spritz like a local on one of the beautiful Piazza's. If this is your first visit to Italy then you'll probably want to visit more than one of this country wonderful cities. This tour lets you do just that. So, if you want to see the unique city of Venice, but don't want to organise your own transport then this is a hassle-free alternative. Your Experience With Venice Day Trip from Milan? Take a full day trip from the Italian Capital of Fashion to the Italian Capital of Romance and back again with free time to explore the floating city of Venice, visit museums and art galleries or shop for souvenirs. Learn about the city's history and construction from a knowledgeable English speaking guide on a 2 hour walking tour. Drift along the pea green canals on a Venice boat trip. What Venice Day Trip from Milan Includes? Return transportation by air conditioned coach to Venice. 2 hour guided walking tour in Venice and boat trip on the Venice lagoon. Meet in central Milan – drive to Venice – take a riverboat to San Marco Square – city walking tour – free time – riverboat to Piazzale Rome – return to Milan. Travelers Reviews about Venice Day Trip from Milan? 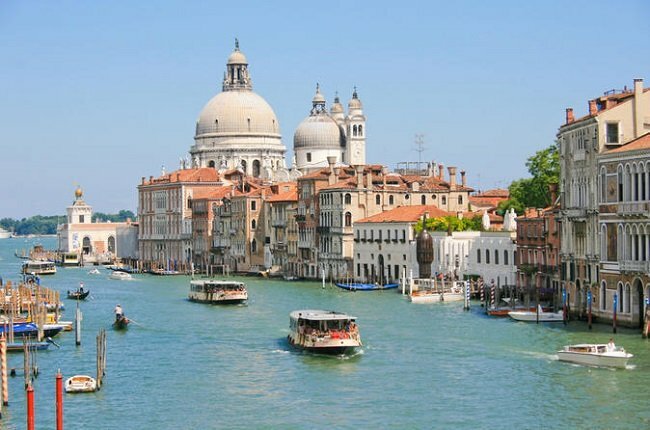 Travellers say that this is great if you're looking for a whistle-stop tour of Venice. Comments agree that the tour is well organised and that you will get to see the main city sights during this tour. This tour has an average 4.5-star rating on Get Your Guide. Similarly, Viator and TripAdvisor users have given this tour a 4.5 out of 5-star rating. Refunds are available if cancellation is made a minimum of 5 to 7 days in advance, depending on tour provider. Tours in Spanish are available on specific days during peak season. Venice is a walking city, we recommend wearing comfortable shoes. Food, drinks, tips, Gondola rides and hotel pick-up/drop-off are not included in the ticket price.